It’s Sun-DIY, folks. Time to bust out the staple gun. For this project, I’m combining my affection for all things Mid-Century modern and my Linsanity for Southwestern, folksy, tribal textiles. I know, I know – the whole Navajo Aztec Incan Mayan pattern thing is huge right now, but my love affair with ponchos and Southwestern/Mexican motifs dates waaaaaay back to pre-hipster days. 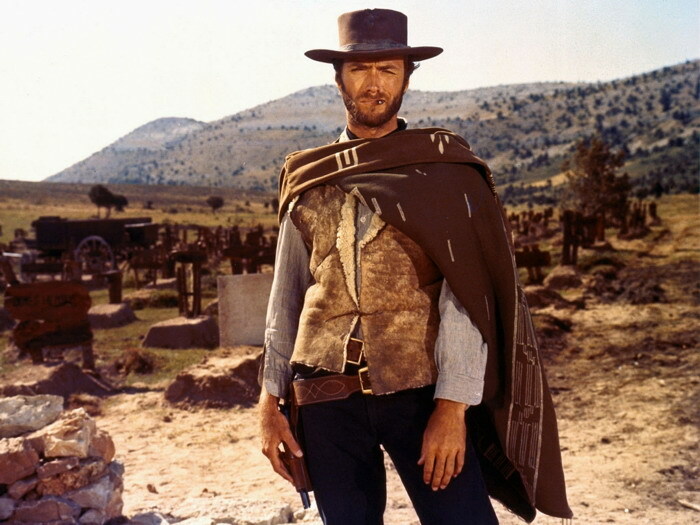 And I can honestly say that Clint did it for me when I watched him in his Spaghetti Westerns (yeah, so they were Italian and directed by Sergio Leone, but one could argue that Leon stole borrowed from Kurosawa’s Yojimbo so neener). Now THAT’S how you wear a poncho. 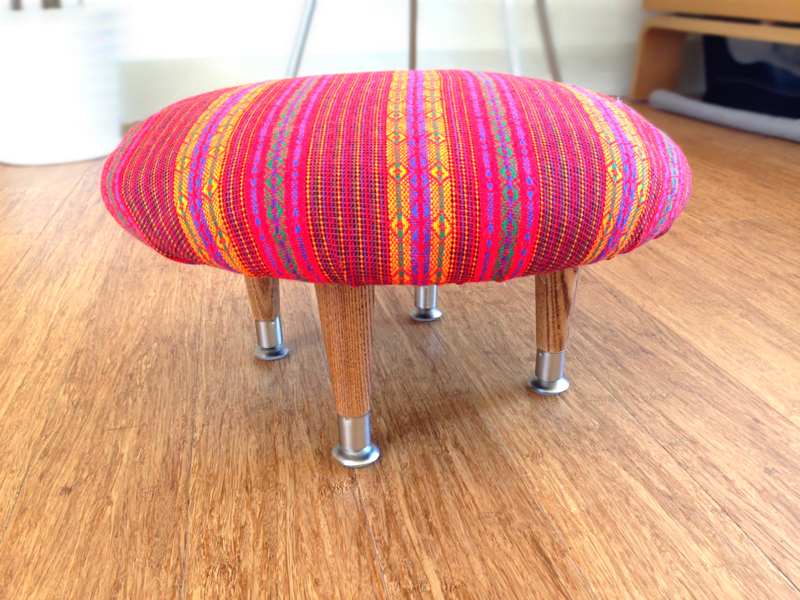 This brings me to today’s DIY project: a lovely little stool that’s relatively easy to make and oh-so-purty to see. 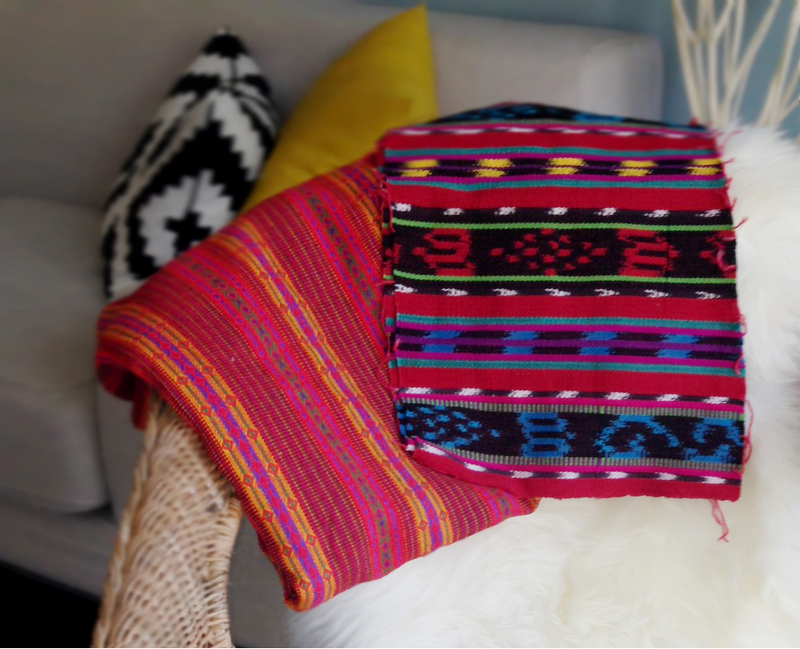 It took me a while to complete it simply because I was looking for the right kind of serape fabric. 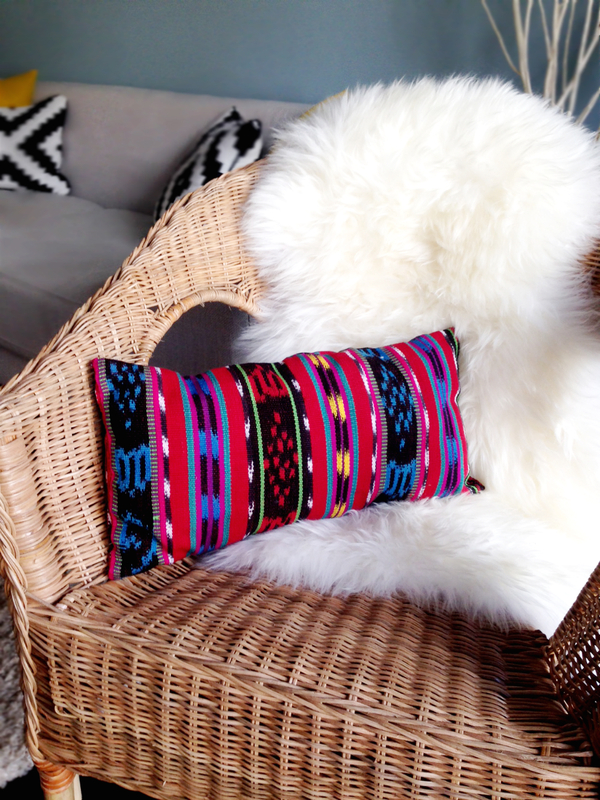 Serape is wildly popular in home decor right now and with good reason. Stunning motifs and vibrant colors bring rooms and furniture to life. Mix it up with my favorite style of furniture and vavoom! Insta-chills and butterflies. 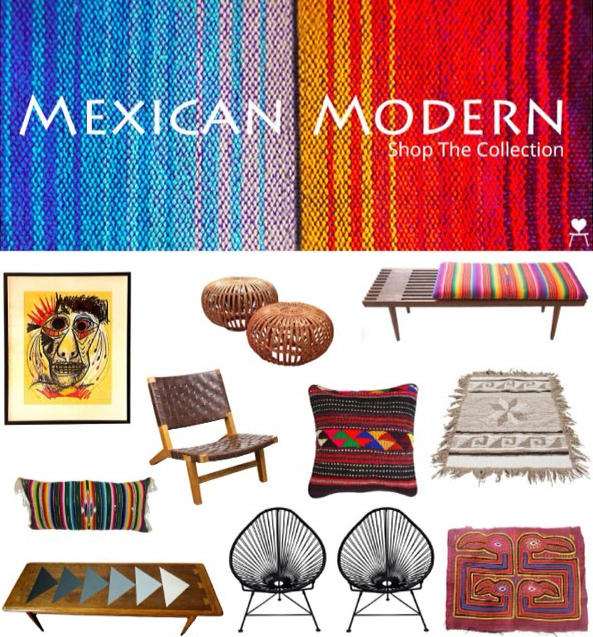 We curated a Mexican Modern collection at Chairish a while ago and some of those pieces have remained in my mind. I just adore the blend of vibrant colors with the simplicity and neutrality that’s so typically Mid-Century modern, so today’s DIY is in honor of this very hot combo. 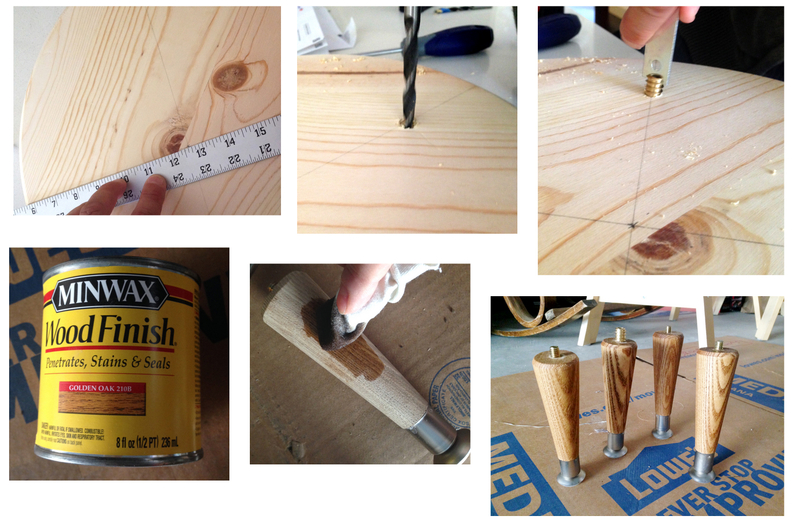 4 tapered furniture legs, 5″ to 6″ in height. I bought my 5.5″ legs from Lowe’s for about $4 each. You can get them at Home Depot as well. A 14″ round panel. I picked mine up from Lowe’s for $7. 4 wood insert nuts, 5/16-18, from Lowe’s for about $1 each. These are for your legs to attach to the round panel, or seat. You can attempt to screw the legs in without the insert nuts, but they won’t be as secure. Minwax stain (I already have a ton of this, but you can pick up easily from any hardware store or even Target). Drill with a 3/8 bit. Serape fabric, at least 1/2 yard. I searched high and low for serape fabric and even went to Britex as a last resort, but they didn’t have anything that stood out to me (not to mention the eyeball bulging price tags). I felt as let down as I did when I found out that David Bowie’s “China Girl” wasn’t about me. But the DIY Gods pulled through with the discovery of 2 fabulous pieces of serape fabric, one sample at Scrap SF and the other at the Alemany flea market. The Scrap sample (for $1!) was too small so I turned that into a small throw pillow. The fabric I found at the flea market cost me $10 for 2 yards. OH Hells-to-the-YEAH. Now that we’re appropriately fabricked (I made that word up), let’s begin. We started with the round wood panel. Using a ruler, measure off the center point of the round and draw a line across the diameter. Now flip your ruler perpendicularly and do the same. We measured 2.5 inches in from each line to mark where the feet will go. Drill a hole the same depth as the wood insert nut. Screw in the wood insert nut tightly. Stain your legs. I used 2 coats of Golden Oak to make it richer but not too much darker. You can apply a polyurethane finish if you want to protect the wood well, but it’s not necessary for a foot stool in my opinion. 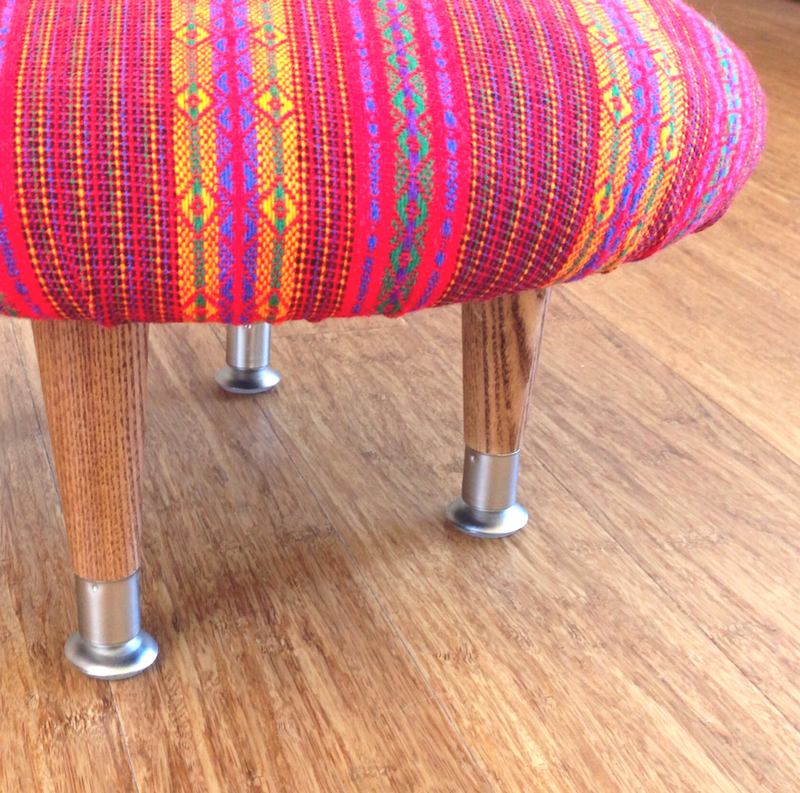 Now it’s time to upholster your stool. Did that sound weird or is it just me? Cut a piece of fabric at least 10 inches wider than the panel. 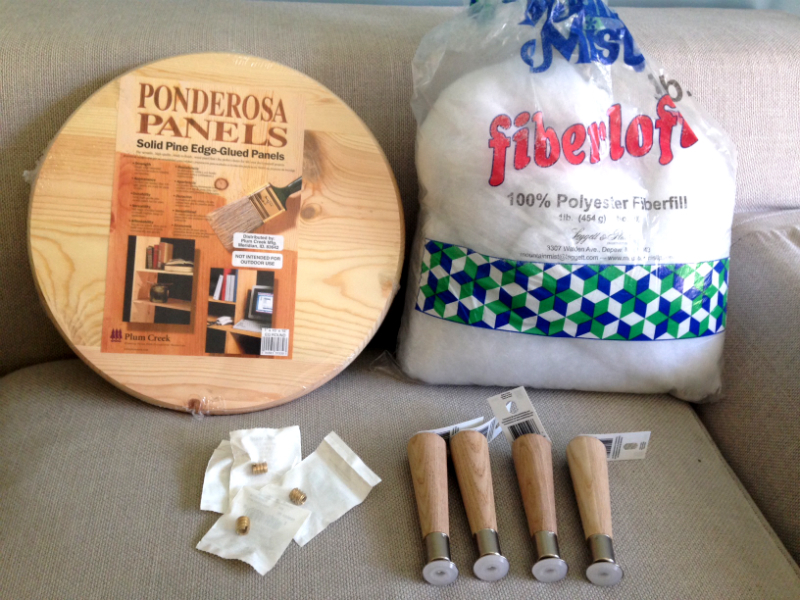 Gather the fabric around and staple gun the fabric to the panel. The folds are tricky and you might have to remove and re-staple as you go along. Pull and flatten as much as you can without bunching up the fabric too much. Cut the access fabric off. We used an old black t-shirt for the base. Cut a circle that is slightly smaller than the panel. Staple gun it to the panel, covering the edge of the serape fabric. Turn it over and screw the legs into the wood insert nuts. 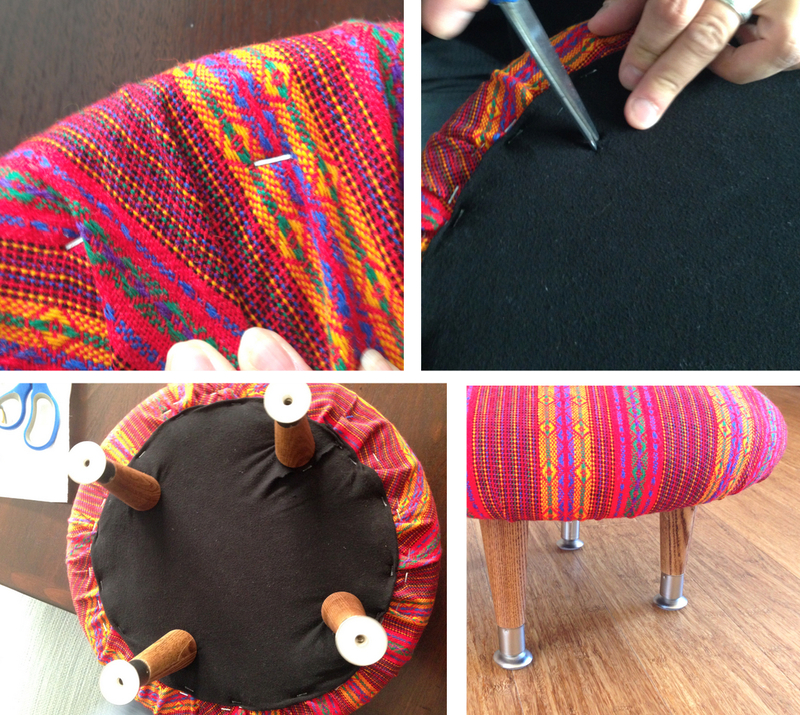 You don’t have to make holes through the base fabric – the legs will screw right in. 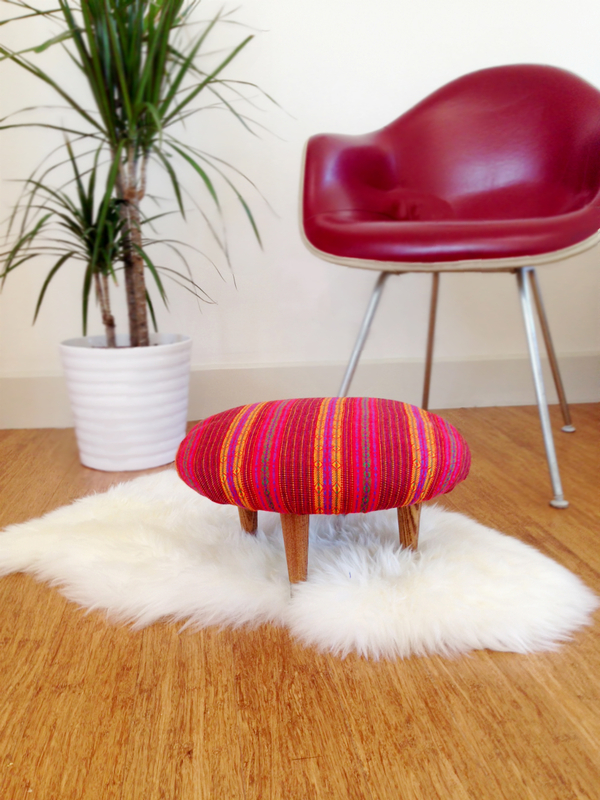 Well, hello there cute serape stool! I love me a great set of (tapered) legs. And my purty piece of scrap from Scrap is now a sweet little throw pillow that brightens up my living room. Not too shabby for a buck and some change. It ain’t cheap, but for a few dollars more, you get a timeless piece that’s one-of-a-kind and a keepsake to pass down in the family for generations to come. That’s what I call serape therapy. WOW! Love that fabric! Well done you! Thanks m’dear! I consider myself super lucky for finding that fabric! The chair you have with the stool is cool! Great DIY! We’re big into Mexican/South west patterns in my fam so this hits home for me – love it! Thanks for liking my post on the fabric I am weaving. Co-incidently, it is the fabric to make a footstool – keep an eye on my blog as I will be posting it up soon 🙂 You fabric is fantastic – lovely job. Will do! Can’t wait to see it- the fabric is lovely! of the most useful blogs on the net. I most certainly will recommend this website! I have been searching all over the Internet for serape fabric. I want to recover a chair. Please help me find some.